For some, it’s nothing more than a low hum, while for others, it can seem as loud as an engine, with a body-shaking vibration to match. Either way, it’s a sound that signals comfort and safety—all emanating from the body of one of nature’s fiercest predators. Whether it’s coming from your average house pet or a ferocious cheetah, it’s a question that keeps coming up: why do cats purr? Anyone who has ever had a pet at home knows that domestic animals exhibit a fascinating and wide range of behaviors. These behaviors illustrate the tension between the creature comforts (pun intended) they enjoy as pampered pets of the modern era and the sheer animal instincts that were developed in the millennia before domestication. From the way dogs interact in packs to the way a dog or cat may circle the spot they intend to lay down in a few times before actually doing so, the way that pets behave tends to speak for thousands of years of experience and adaptation. So what does a purr mean, and what can it teach us about the cats emitting it? It’s surprising to find out, but more is known about why cats purr than how they purr, which, even after extensive scientific research, remains speculative. In terms of brain function and purring, all that science has really been able to tell us is that it has something to do with “neural oscillations”—AKA, brainwaves. Then again…so does pretty much everything. In terms of the physical manifestation of a sweet little purr, it’s speculated that it comes from within the voice box, where muscles expand and contract, creating a vibration as the feline breathes. Another factor may be what is called “hyoid ossification,” which has to do with another weird fact: no cat who can roar can purr, and vice versa. 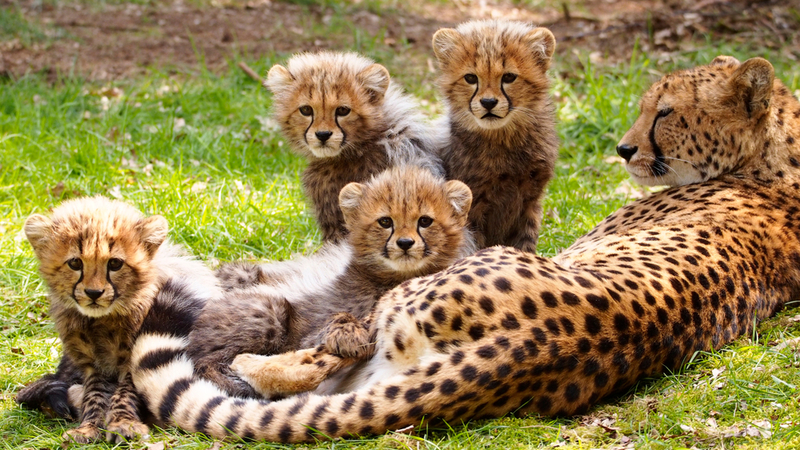 That’s right, many of the larger species of big cat, like lions and tigers, do not purr—but cheetahs, cougars, snow lions, and a few other species still do. What’s up with that, and what does it have to do with hyoid ossification? Well, the hyoid is a bone in the larynx (or voice box). Some scientists argue that when the hyoid bone isn’t fully ossified, as in lions and tigers, it enables the cat to roar. When the bone is fully formed, cats both big and small are able to achieve that mysterious purring sound, though it keeps them from roaring. 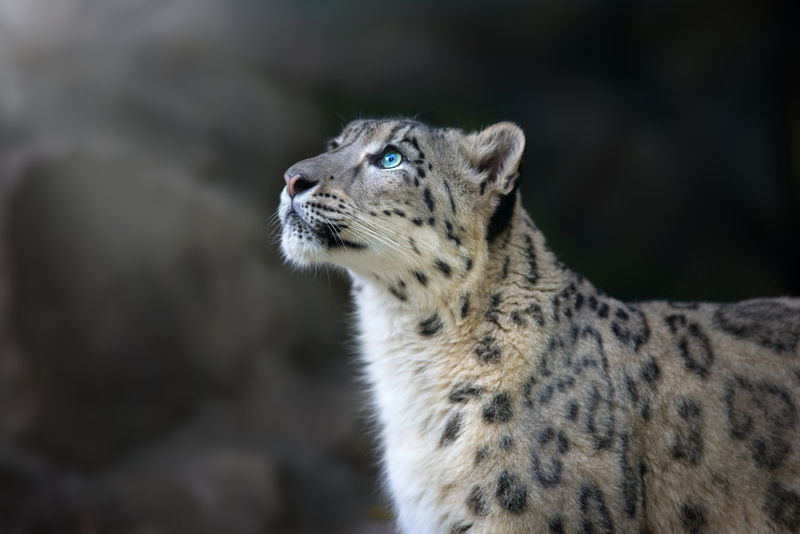 But this is just one, likely flawed, theory: for example, the snow leopard has an incompletely ossified hyoid, but it purrs. Purring is just one of the many ways cats communicate, along with meowing, growling, hissing, body language, scent rubbing, etc. Each form of communication serves a different purpose, and purring generally seems to show that the cat is content. The different forms of communication are also meant for different audiences—many (including yours truly) may be surprised to learn that adult cats don’t meow at each other. They only meow at other animals and humans. As for purring, it appears to be a fairly universal signifier of contentment, and some animal behaviorists believe that it may have developed as a way for a mother cat to communicate a sense of security to their young. In rarer cases, a cat may purr to express other states of being. Because purring usually expresses comfort, some cats may purr in the presence of other cats to signal that they don’t intend to cause trouble. When they are newborns, cats purr when feeding or trying to feed. 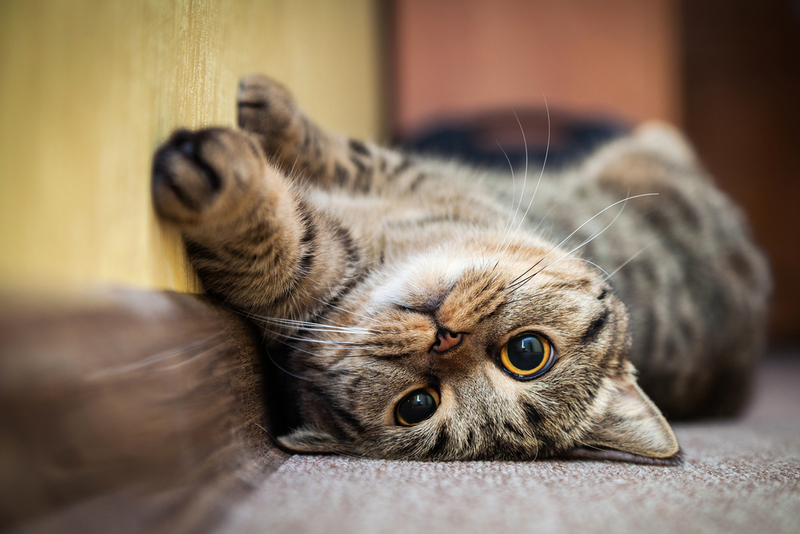 In situations where a cat has a one-on-one relationship with the human who feeds them, they may even use a high-pitched purr in an attempt to signal hunger. Every once in a while, a new article or news item pops up reiterating that humans can actually trick themselves into feeling better by smiling or laughing, even if they’re faking it. Similarly, cats may actually purr when they’re in distress for a comparable reason. It’s been posited that the act of purring may release a calming hormone that can help dampen the pain the cat is experiencing, and that mother cats may purr during labor for this reason. Interestingly enough, the frequency—as in sound, not prevalence—of a purr may also have healing powers. Cats are known for sleeping a lot, averaging about 15 hours a day, if not more. A side effect of disruptions in the sleep pattern is a loss of bone density, but the frequency at which a housecat’s purring occurs (25 Hz) is actually one that can help promote bone density and healing—something that seems simply too well-aimed to be a coincidence. Sometimes, a nice purr from a cat may be accompanied by a more kinetic expression of contentment: the knead. This is when a cat moves their paws up and down as if they were a human kneading bread, pushing their paws down and extending their claws before lifting up again. It’s often a precursor to sleeping, and because it’s generally done to a soft surface—for example, a lap, a blanket, or a couch—it’s been suggested that it’s an evolutionary remnant of when cats would tamp down grass or other organic matter outdoors to sleep on. It may also be related to the action of newborn kittens kneading the mother in order to properly latch for feeding. 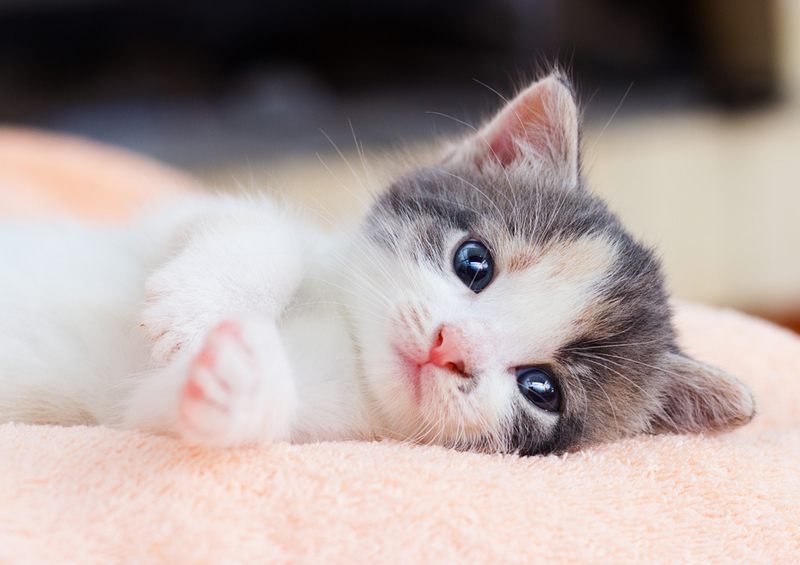 Some cats may even adopt a favorite blanket for performing their act of kneading and purring! The beneficial effect that the presence of animals can have on humans is well-known—think of all those programs now where cats or puppies are available to comfort those in need in hospitals, nursing homes, schools, and airports. And for us humans who are lucky enough to have a happy cat around, the cat’s purr can have a relaxing effect as well. People generally associate the sound with peacefulness and tranquility. We may also be hard-wired to respond to purrs as well, since the lower frequencies in a purr aren’t that far off from the frequencies in a baby’s cry. These associations work to draw pet owners closer to their feline charges—a situation that’s good for both the cat and their human! 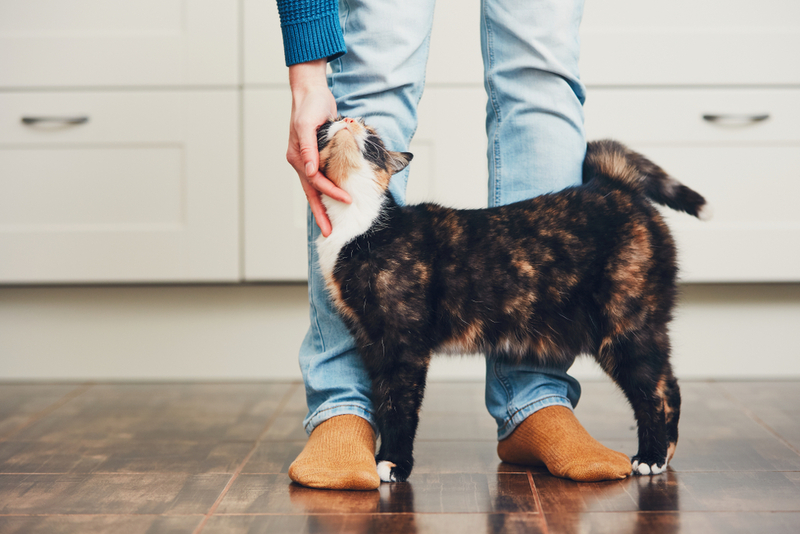 Even after a slew of scientific research, the “how” of purring is still a mystery—but there seems to be a consensus on the “why,” at least most of the time. 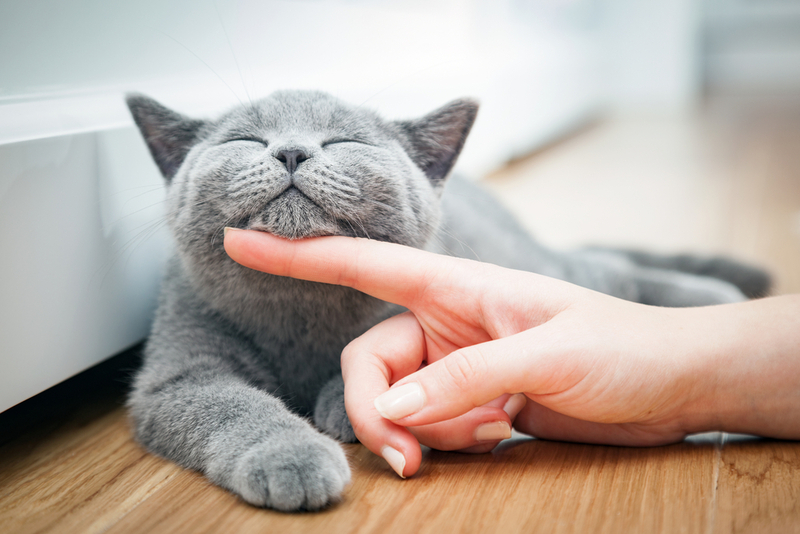 If your cat is purring, there’s a good chance they’re feeling content—and if you have a chance to sit with them and soak it up, it may just rub off on you too!